Some years ago, I stopped blogging on howardowens.com for personal and professional reasons. With the site dormant, it became an easy target for script kiddies. I had a major problem with spam being injected into the site. I didn’t have time for proper security. So I migrated all my posts to a Drupal installation on a new host (I also felt my former host had its own security issues it wasn’t addressing). 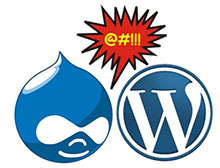 While I think Drupal has been great for The Batavian and has its place in the online publishing world, it’s not a great individual blogging platform. In short, I missed WordPress (even though my first blogging platform I built myself from scratch in Cold Fusion). I especially came to miss it after I launched VuFindr.com nearly a year ago (almost to the day). Working in VuFindr every day for the past year just made it really clear that if I really wanted to do any kind of personal blogging again, I needed to migrate my content back to WordPress. Well, it turns out, it’s a lot easier to get content into Drupal than get it out. I read the online instructions and realized it was something I could noodle my way through if I were willing to set aside several hours to do it. Well, I don’t have several hours for such a project. So my dream of converting back to WordPress languished. I offered to pay a couple of people I know to do the work, but they weren’t interested. Then two days ago I discovered almost by accident a service offered by Jordi Cabot, a man in France, who has made a business for himself converting Drupal sites to WordPress. It’s calld migratetowp.com. For a mere $100 he did the job for me, was super friendly and super responsive — it was an all around great experience working with him. I gather he can handle other platform migrations, such as Joomla to WordPress, as well. So, for anybody who needs to migrate from one CMS to WordPress, I highly recommend you hire Jordi. This entry was posted in Uncategorized and tagged blogging, cms, drupal, wordpress by Howard Owens. Bookmark the permalink. When I moved from Drupal to WordPress, I copied and pasted every darn entry. That migration business is a great idea — props to him for coming up with it. Thanks for your nice words Howard! Migrating from ExpressionEngine to WP is no picnic, either. I’ve actually followed the Batavian for a couple of years for the music scene coverage and Darien Lake shed arrest roundups. Nice to find the man behind the curtain. Is the Batavian running Drupal? The Batavian is on Drupal. I´ll be happy to help in your migration Bill.